A group of kids compete with a team of bumbling pirates to find buried treasure. Movies i've seen and liked. While being on the run for saving a mouse, the famous Puss in Boots, Pero, helps a young peasant boy win the heart of a lovely princess, while trying to rescue her from an evil wizard. This is the sequel history of "Panda. Go, Panda. (1972)". The trio (the young girl orphan, a panda cub and his father) are joined by a tiger cub who has escaped from a circus. The witch Baba Yaga keeps her servant the Egg Princess confined and forces her to do hard daily chores around the mill. One night, a batch of kneaded dough comes to life and befriends the Egg Princess. This is one of the several films, in which the great Miyazaki was involved with. Made back in 1971 when he was still an animator and story adapter for anime. Way before he became more well known as director of his later works. Animal Treasure Island is like the story of Treasure Island but only half different from the original story. In this one 90% of the characters are animal humanoids and the 2 main characters are human. It starts with a quiet night in some old English like sea port village. Where Jim and his mouse friend Rex are looking after the hotel they live in. It was boring for them right till a large cat comes in to rent a room for the night. The cat tells Jim to warn him about anyone looking suspicious. Jim has no idea what is going on right till he finds out that the cat is being hunted down by pig pirates. The cat gives Jim the item they want back, and is told to hide it from them. After the pigs search the place clean, Jim and Rex find out the item is a map to treasure island. This is a big opportunity for Jim and Rex. Cause with the treasure they could start a new living instead of looking after a hotel all day. So they set out for adventure, and little do they know is that they be encountering over hundreds of pirates who want the map for themselves. As well as this girl name Cathy who is stronger than she looks. Animal Treasure Island is a great classic. You find similarities from Miyazaki's later works. Such as pigs and strong hearted boy and girl characters which is common in a lot of Miyazaki's works. It's not directed by him, but he was involved with the story and animation. Which still makes it a Miyazaki related anime. Just know that this movie is fine for kids to watch. It only contains cartoon violence(no bloody involved), drinking, a toddler wetting himself, some smoking, and no swearing at all. Since this film was made for kids when it was released in Japan. The animation is well done for a movie from 35 years ago. It has some slap stick humor. And the black humor is like the kind you'd see in "Busy World of Richard Scarie" such as a scene with a Pig selling Hot Dogs. It has plenty of exciting and action packed moments here and there. But all and all it's something the kids can watch again and again. Your able to buy this movie on Discotek Media's DVD release of it. Has both Japanese and English versions. Excellent quality, widescreen format, and 3 trailers including one of "Taro the Dragon Boy" which is another anime film produced by Discotek Media. 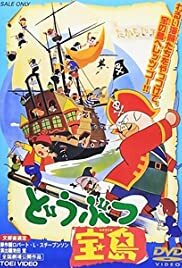 Animal Treasure Island is indeed an anime classic.